Ald. 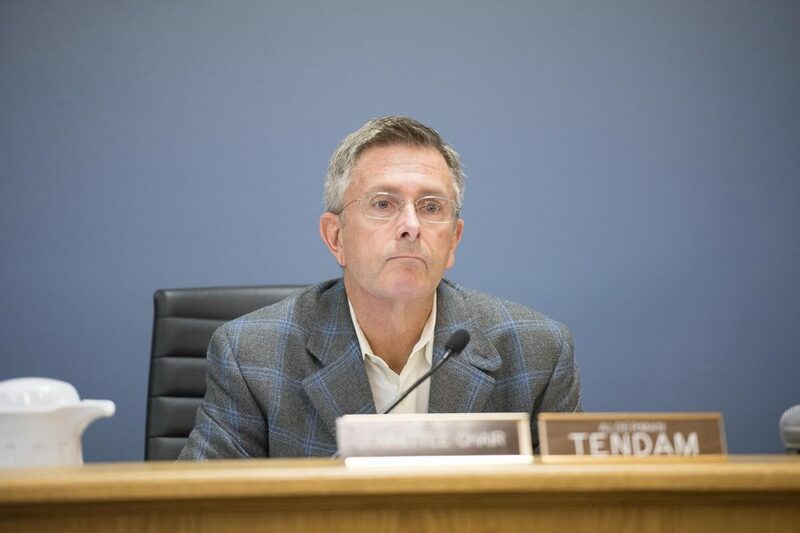 Mark Tendam (6th) attends a city meeting in February. Tendam said at a mayoral forum Wednesday night that the brothel law should be removed from city code. Several candidates in Evanston’s municipal election discussed how they plan to achieve the city’s affordable housing goals at an event hosted by a local church. The Wednesday evening event, hosted by Grace Lutheran Church, was organized by Evanston religious organizations and Interfaith Action, a homelessness advocacy organization. Mayoral candidate Ald. Mark Tendam (6th), 9th Ward aldermanic candidates Shawn Jones and Cicely Fleming, and 8th ward candidate Rob Bady attended the event. Ald. Ann Rainey (8th) did not attend, but sent a representative to read her responses to the questions. Mayoral candidate Steve Hagerty also did not attend. Hagerty said in a Facebook post he had a previously-scheduled campaign event. Affordable housing has long been a focus for Evanston officials. Aldermen voted in 2015 to pass amendments to an ordinance intending to create more affordable housing units. These amendments went into effect January 2016, but the candidates in attendance at Wednesday’s felt there was more to be done to improve affordable housing in Evanston. In her prepared answers, Rainey advocated running a pilot program to create affordable residences for low-income families. Jones agreed that Evanston should create a subsidized housing program. He also proposed converting areas of Evanston into “micro-housing” as a solution to the problem of affordable housing in Evanston. Microhousing includes dorm-sized apartments and often features common spaces. Fleming countered this idea, saying that communities like the ones proposed by Jones can create isolation for the people living in them. Fleming said the city should work on seeing the issue of affordable housing from the perspective of the people it affects. Bady suggested the city partner with Northwestern to develop affordable housing in regions of the city that need it most. The candidates at the event also discussed their positions on the so-called “brothel law,” an Evanston zoning ordinance that prevents more than three unrelated people from living in the same residential unit. The law was not in use until 2011, when city officials announced she would start enforcing it. After outcry from Northwestern students, the plans stalled. The ordinance, which still remains in the city code, was decried by the candidates as unnecessary. Rina Campbell, one of the event’s organizers, said she hoped the event would set up the affordable housing movement in Evanston for success in the future.